UPDATE: CSC is in search of a Team Photography Chairperson to coordinate with Mr. Beck of Elite Photography, to pick up the Club's orders (once a season) and to coordinate pick-up by parents who have ordered. To volunteer, contact our Parent Rep. Thank you! Chesapeake Soccer Club has teamed with Stan Beck of Elite Photography LLC for our team and individual photography needs. Many of our members have already worked with Stan in other sports and/or clubs because he shoots many local sports organizations, including the City of Chesapeake soccer and softball for example. We encourage our teams to work with Stan to ensure you have the photos to remember the season for years to come. There is no cost to have the team's photos taken. 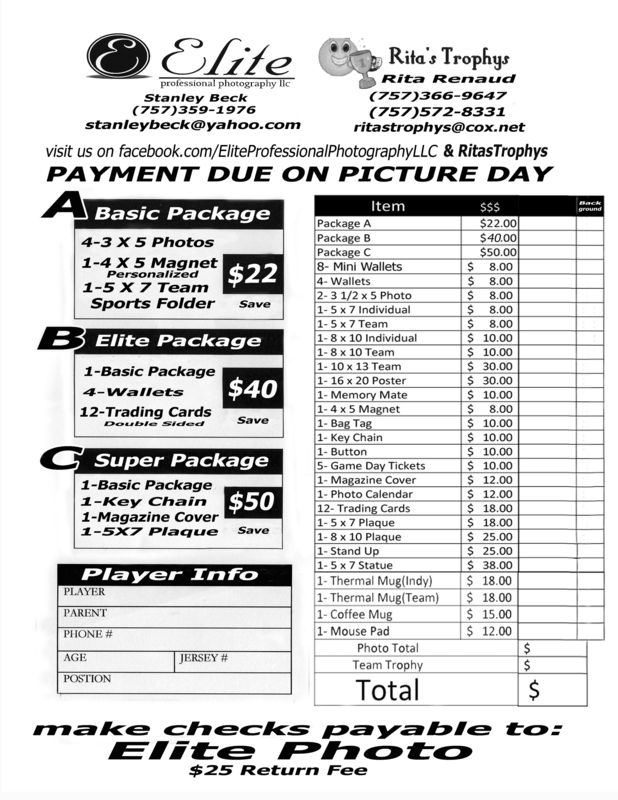 Each player pays for the photos and/or packages they want. This is voluntary - Full participation is encouraged, but not required. Once you decide as a team to get your photos made, the whole team should be present though so you have a good team picture. Photo shoots will be at our Centerville Park fields. Sample products can be viewed HERE. Pick two or three dates that your team can be present and ready for photos (a practice works best). Inform your team where to be and when. Inform your team to download the order form HERE - he always has copies, but it goes faster if you have it already filled out. The shoots go very fast - Allow about 30 minutes total, but they are usually done in about 10-15 minutes.